Product prices and availability are accurate as of 2019-04-20 18:24:10 EDT and are subject to change. Any price and availability information displayed on http://www.amazon.com/ at the time of purchase will apply to the purchase of this product. 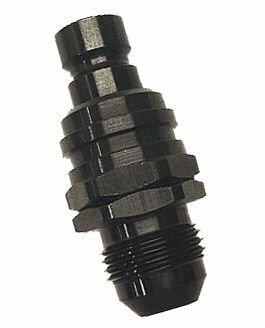 Jiffy-tite 5000 Series Aluminum Quick Disconnect Fluid Fittings Male AN Plug Jiffy-tite''s patented valve technology in both the socket and plug assembly assures a 100% leak-proof seal, and the ribbed collar provides an absolute slip-proof grip. Jiffy-tite''s Quick Connect Fluid Fittings provide minimal flow restriction for virtually any fuel, water or oil system on the market today.